Just a little while ago I landed in Salt Lake City and have about two hours to wait for my connecting flight to Baltimore. 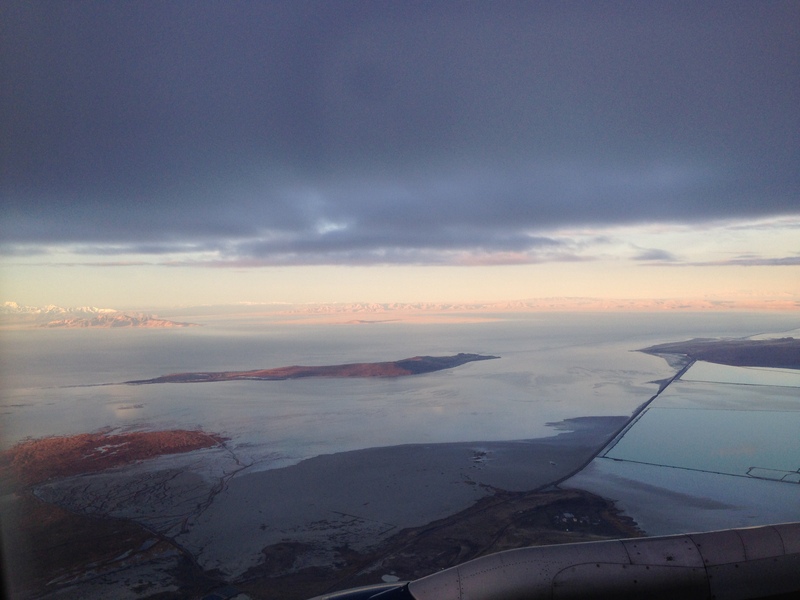 It was a quick flight from Boise to Salt Lake, about forty or fifty minutes, and the scenery was beautiful, especially as the sun rose over SLC as we came in for the landing. Getting through security this morning was quite trouble free now that I’m TSA pre-checked. There was a line of about forty or so people waiting to go through security but I was able to bypass it completely and go through the TSA pre-check entrance which also allows you to go through security with your shoes on. I should be landing in Baltimore in about 6 hours, at around 4PM Eastern. I’m looking forward to spending three weeks in Pennsylvania, even though it’s going to be about 40 degrees cooler there for at least the next week. 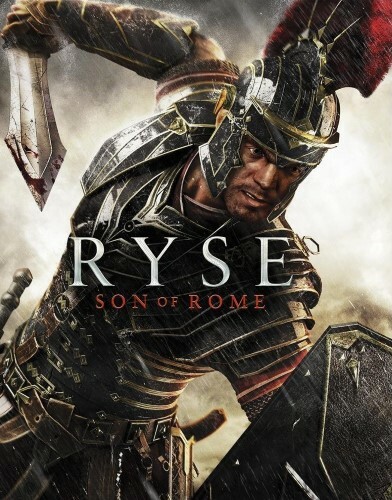 So I’ve spent a couple hours with RYSE: Son of Rome today, and aside from a few technical hiccups it’s been an enjoyable time. For whatever reason the entire first chapter of the game was plagued by flashing white bars that covered my screen during gameplay. Xbox Support on Twitter couldn’t quite figure out what might be causing that issue, but luckily after the first chapter the problem went away. It returned briefly in the fourth chapter but disappeared before the end of the level. Ryse looks absolutely amazing in both cut scenes and gameplay. It’s not perfect, there are some minor issues here and there that take away from the moment (for example on occasion articles of clothing clip through each other) but for the most part it’s visually stunning. The gameplay is pretty simplistic and you can mostly button mash through the game on the easiest difficulty setting, but it’s still enjoyable. You have two main attacks with X and Y and when an enemy is weakened enough you can trigger an execution with right trigger. Once triggered the enemy will glow the color of the button you need to press to perfectly execute the combo (blue for X, yellow for Y). For some odd reason even if you don’t push the button the game wants you to push you can still perform the execution, you just don’t get as much XP from it. These executions are quite satisfying no matter how many times you perform them. They’re worth performing because you have a few different abilities that get bonuses from executions. Using the D-Pad you can select one of several abilities such as health restoration, attack bonus, XP bonus or Focus bonus and upon performing an execution you get a boost to the ability you selected. This adds a bit of strategy to the mix because you’ll have to decide whether you want to risk your health in order to get a damage or XP bonus during fights. You can also push RB to activate the Focus mode which slows down time and makes your attacks incredibly powerful. This is useful when the odds seem overwhelming and it’s quite satisfying to pull of a powerful “sparta kick” with Y that launches your enemy across the screen when it lands. The story isn’t too compelling, but Ryse sure has some great cut scenes (two of which I highlight in the clip below). I’m about halfway through Ryse and I’m looking forward to finishing it off. It’s worth nothing the story takes only about six hours to complete, but there’s a multiplayer arena mode that I haven’t tried yet. I’d recommend renting Ryse (I got it through GameFly) and giving it a try. If you’ve enjoyed the recent Batman games you’ll likely enjoy Ryse’s gameplay. Before I go, it’s also worth noting the game is completely linear, but that’s not always a bad thing. I’ve enjoyed it. I just started playing RYSE and am getting these flashing white bars on the screen. 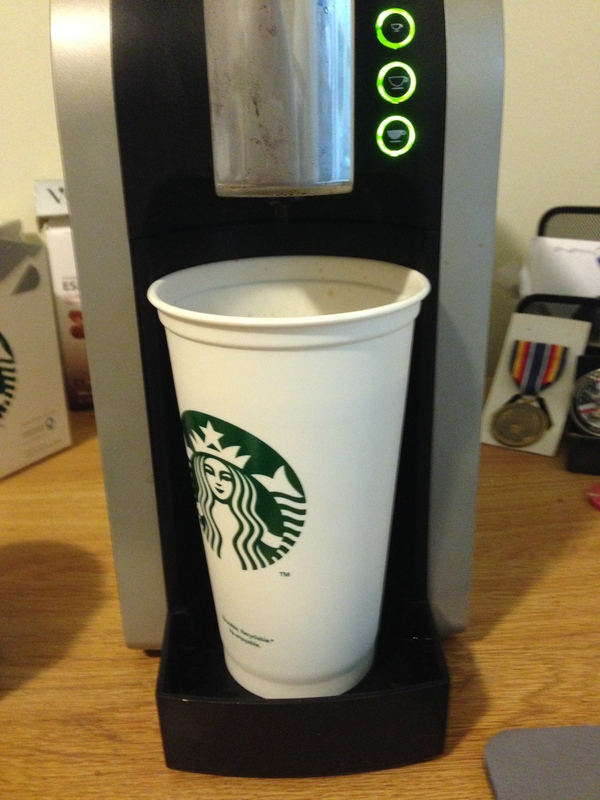 I don’t think it’s supposed to do that. Anyone know a fix? I’m about to restart my Xbox to see if that helps….Weird. Next Friday I head back to my home state of Pennsylvania and I’m excited to be around some of the things I miss about the East Coast. I’ve been stationed at Mountain Home AFB, Idaho for nearly two years and although it’s been nice there are quite a few things I can’t get out here. 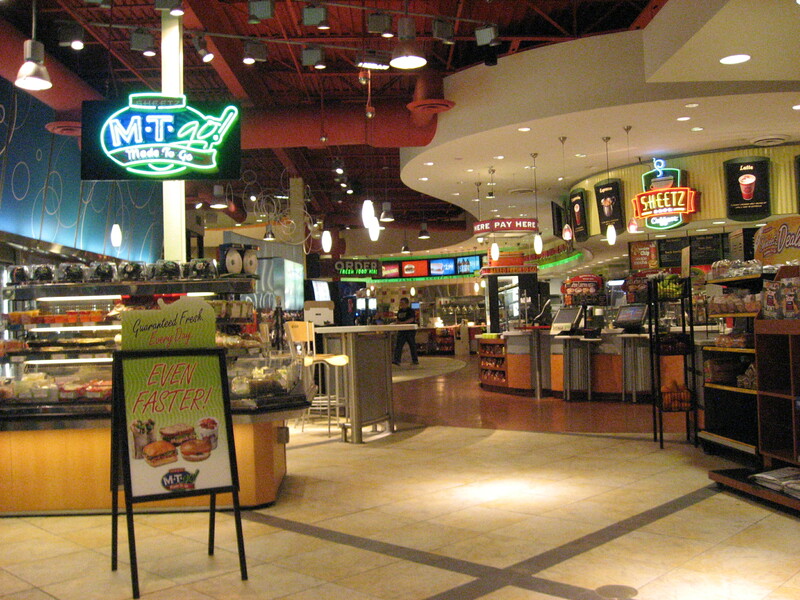 First there’s Sheetz, the one stop spot combines a gas station, convenience store, sandwich shop (MTO’s, or made-to-order sandwiches) and a coffee shop. I worked at a Sheetz in Red Lion, PA for nearly 6 years through college and up until I joined the Air Force. It was a great place to work, always bright, vibrant and alive even during the night shift. You had the chance to meet hundreds of interesting people a day in a fast paced environment. I also enjoyed the food. I’m excited to see what has changed since the last time I was home over a year ago. Things at Sheetz would change pretty often so there’s a good chance there will be quite a few new menu additions waiting for me when I stop in next Friday. 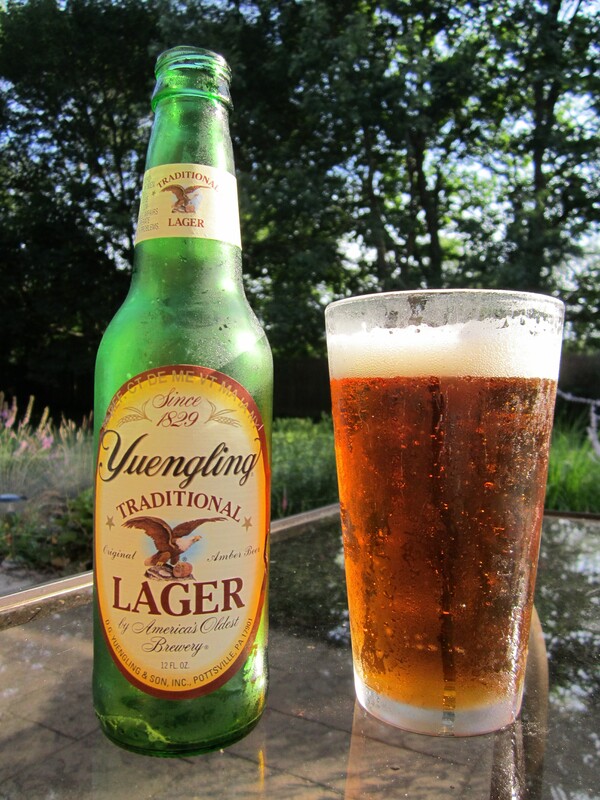 Next up is Yuengling lager, which is also native to Pennsylvania. It’s been my favorite beer ever since I turned 21 and I’ve never found anything that rivals it. I remember one of the first times I went out while I was at Keesler AFB, Mississippi and I tried to order a Yuengling only to be met with confusion by the waitress. It was a devastating revelation to realize I wouldn’t have access to my favorite beer in other parts of the country. 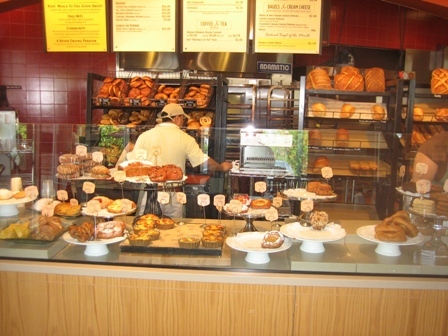 Panera Bread can be found all over the country, but for whatever reason there isn’t one in Idaho. Panera Bread is easily my favorite ”fast” restaurant and I’m quite excited to visit once or twice while I’m in the northeast. Today I traded in my old 120GB Xbox 360 Elite and just a handful of games at GameStop and walked away with much more than I expected. 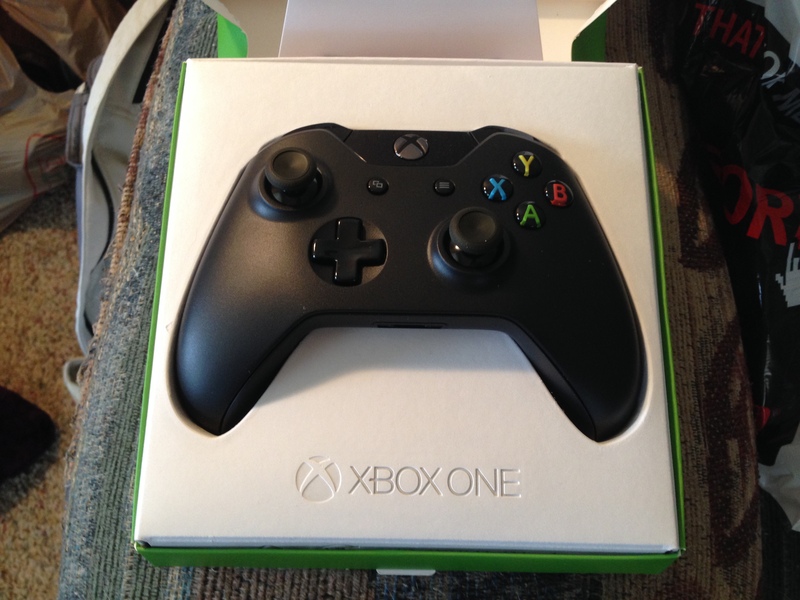 The total came to around $97 which I used to purchase an Xbox One controller with charge and play kit. I’m glad I was able to get a second controller because I’m heading home on leave next Friday through the 21st of March and it’ll be nice to play Call of Duty and later Titanfall with my brother on the Xbox One. I love the packaging that the controller came in. The box is nice and clean and the presentation is nice on the inside (very Apple like). So I was trying to get into some Call of Duty: Ghosts multiplayer a little while ago but I kept getting an error saying to go to callofduty.com/ghosts/status. I went there and everything said it was up and running. I decided to go ahead and play some Forza 5 in the meantime and noticed that I wasn’t getting any drivatars in my race, they were all AI drivers (you can tell because they all have first initials and last names, ex: B.Smith). 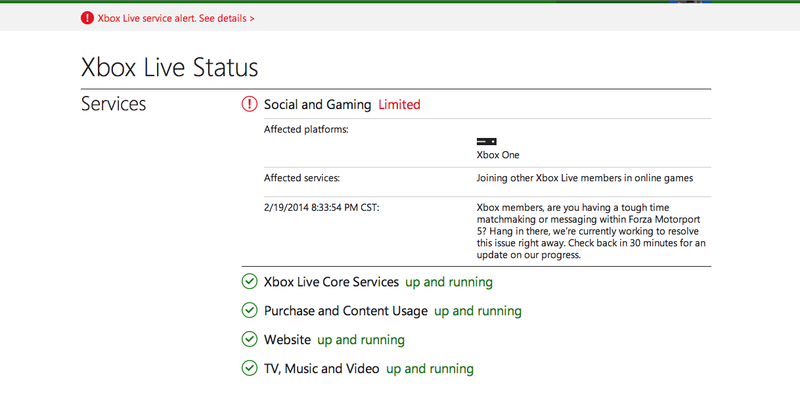 It turns out that Xbox Live is having some issues with the ‘social and gaming’ services for Xbox One users. Everything else is up and running, I’m able to do most of the stuff you can do on Xbox Live, I’m just having issues connecting with friends and getting into online games at the moment. If you’re experiencing the same issues be sure to check out Xbox.com/status for updates. Hopefully it’s back up soon!